An adult female tree skink after performing the discrimination task we used to quantify their learning ability – she successfully removed the blue lid from this dish and accessed the food reward . Photo by Anna Küchler. Animals learn about their environment and use what they have learnt while foraging, to increase mating success, avoid predators, and overall increase their chances of survival. An animal can learn by themselves, but this can be a long and difficult process. Alternatively, an animal can learn through the use of social information that is observed through “spying” on others. This is often an easier strategy, unless the social information is not accurate. We can relate to this – often when figuring out a problem, it’s easier to get help from a friend or teacher, rather than struggling through it on our own! In particular, social animals are likely to have more of a chance to observe others, and learn from them. We studied if tree skinks (Egernia striolata), a social Australian lizard, can learn from others. Two tree skinks basking together beside a rock crevice in their natural habitat. Tree skinks are part of the Australian Egernia-group of social lizards, which across species, displays a diverse array of social and mating systems, including family-living and parental care. Photo by Martin Whiting. 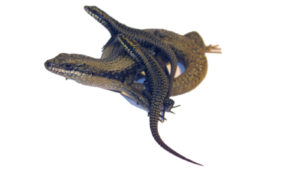 In a previous study, we wanted to test whether adult female skinks can learn from another female. We trained a group of lizards to remove a lid to forage for some delicious fruit puree. In research, this type of challenge is called a ‘motor’ task. Once they were trained, this group of lizards demonstrated this action to another group of lizards that were naive to this foraging technique. Lizards in this ‘social learning’ group got to observe a demonstrating lizard before they attempted this motor task themselves. We compared this ‘social learning’ group to another group of lizards (our control) that needed to learn this task individually, without any help from others. 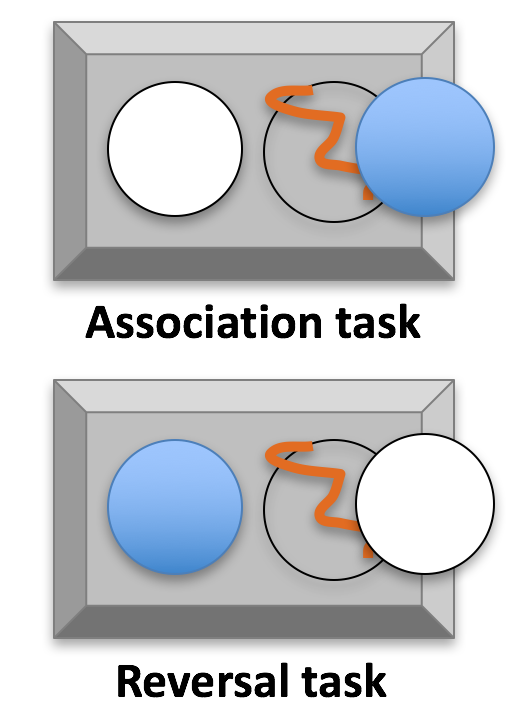 We found that both ‘social learners’ and ‘individual learners’ (our control) were able to learn this motor task! But, we then challenged the lizards with another, more complicated, task where they needed to learn to discriminate between dishes covered by a blue lid or a white lid. This was called the ‘discrimination task’. In this task the delicious food reward was accessible under the blue lid, but not the white lid. 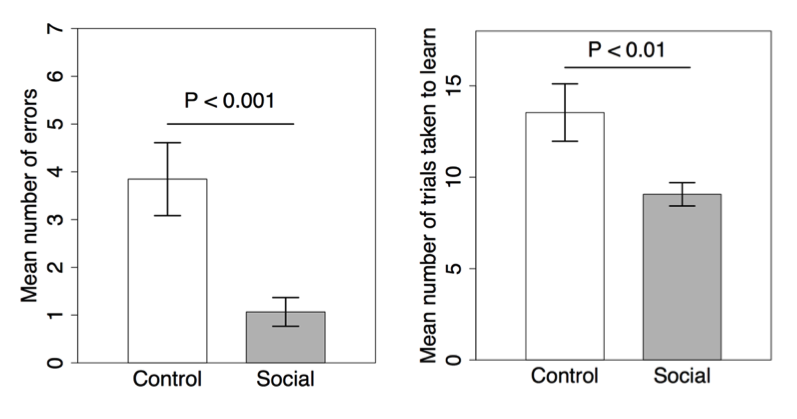 ‘Social learners’ made fewer errors and learnt this discrimination task a lot more quickly than ‘individual learners’ (our control). This means that that female tree skinks learn from one another! In complicated tasks, these social lizards likely use social information as a short-cut to learning. Female tree skinks that were able to observe social information made fewer errors in the discrimination task, and learnt it more quickly than tree skinks that had to learn on their own. This shows that female tree skinks can socially learn! See the entire presentation Fonti Kar made on this study here. Interestingly, we also investigated if juvenile tree skinks, that grew up in different social environments, used social information from an unfamiliar, adult female. We ran a similar experiment to our first, but also added a ‘reversal task’. In the reversal task, the food was now under the white lid. Lizards had to unlearn the rule from the previous, discrimination task (the food is under the blue lid), and now associate the white lid with a food reward (to see the methods for each of the tasks check out this video). In contrast to our previous study, we found no evidence that juveniles used social information from an unfamiliar, adult female. 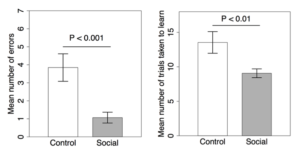 We were a bit surprised that juveniles did not use social information, because adult females do and it is often a beneficial short-cut to learning! But, the use of social information can vary depending on an animal’s age, and the environment and social context in which an animal develops or resides. 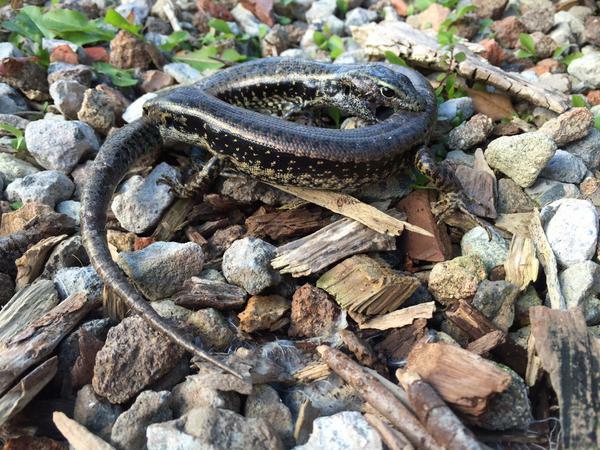 In the wild, unfamiliar, unrelated, adult tree skinks can be lethally aggressive to juveniles in the wild. So, in our study, juveniles may not have been motivated to learn from an unknown adult that could, potentially, threaten their survival. A similar phenomenon has been observed in young guppies (Poecilia reticulata) – they don’t use social information from adults until they are large enough to not be impacted by aggressive advances of adults. All in all, we think that social feedback played a role in our finding that juvenile tree skinks did not use social information from unfamiliar, unrelated adult females. Tree skink mothers often associate with their offspring, and this is thought to give them protection from other adult lizards that could, potentially, attack them. Photo by Julia Riley. Learning is crucial for survival in the animal kingdom. Although we didn’t find evidence that juveniles would use social information presented by an unfamiliar, adult female, we did find that adult females socially learnt from one another. This is the first evidence that a family-living lizard is capable of learning from others!!! 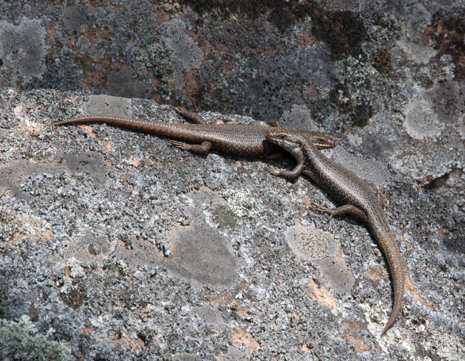 We also show that social learning is not guaranteed to be the default strategy of tree skinks. 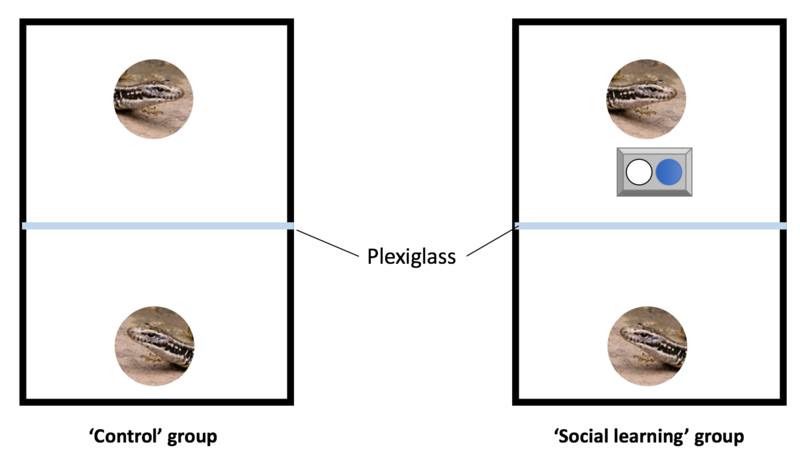 In fact, the use of social learning depends on a multitude of factors (i.e., the complexity of the task, the relationship between the demonstrator and learner, an individual’s age, etc. ), and is likely only used when it benefits the learner. In order to disassociate these confounding factors, we matched skinks closely in size and therefore age and allowed them to fight to determine their dominance statuses (Fig. 1). Winners of this fight was considered ‘dominant’, while the loser was considered ‘subordinate’. We then divided our skink pairs into two treatment groups, a ‘control’ group, where a skink watched their status counterparts do nothing and a ‘social learning’ group, where a skink was able to watch their status counterpart solve a foraging task e.g. a subordinate skink was able to watch a dominant skink, while a dominant skink was able to watch a subordinate skink (Fig. 2). 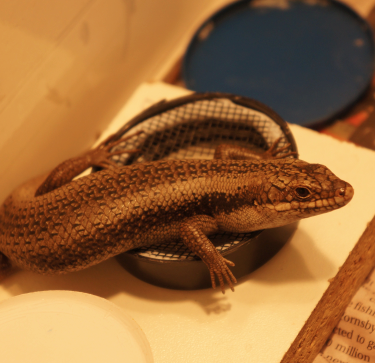 In the association task, skinks had to learn to flip the blue lid to access food. They then had to unlearn this association in the reversal task and learn to flip the white lid. See video below!